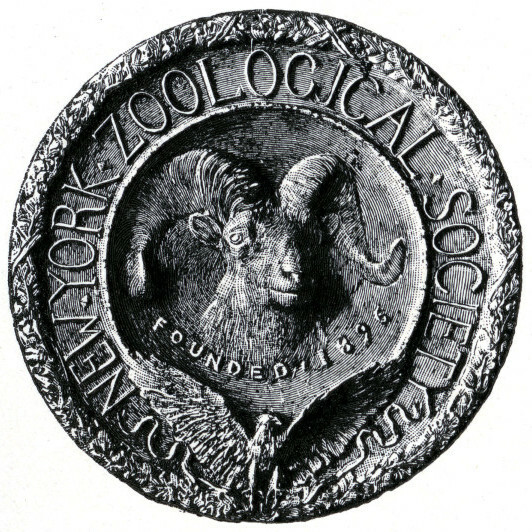 This Sunday, April 26, marks a momentous date in our history: the 120th anniversary of the founding of the Wildlife Conservation Society, then known as the New York Zoological Society. 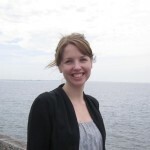 The Society’s start is rooted in the plans of two distinct but converging forces. One of these was led by Andrew H. Green, a civic leader known as the Father of Greater New York for his role in consolidating what would become the City’s five boroughs. 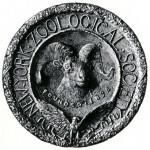 Since the late 1880s, Green had been sponsoring a bill to create a zoological society with the power to establish a zoological garden in New York. 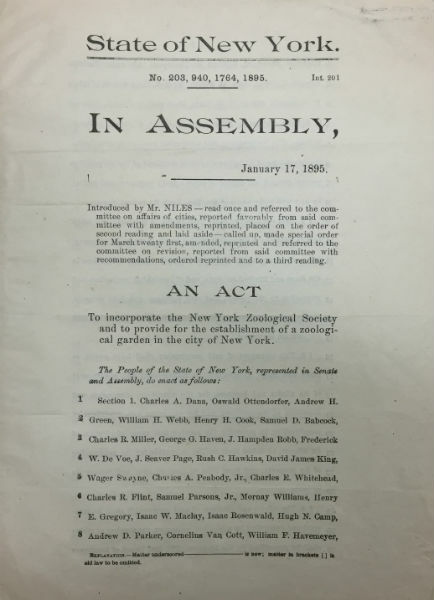 On January 17, 1895, Green introduced into the New York State legislature, via assemblyman William White Niles Jr., a new bill to incorporate the New York Zoological Society and to provide for the creation of a zoo. The very day before the bill was introduced, another powerful figure entered the story: Theodore Roosevelt. 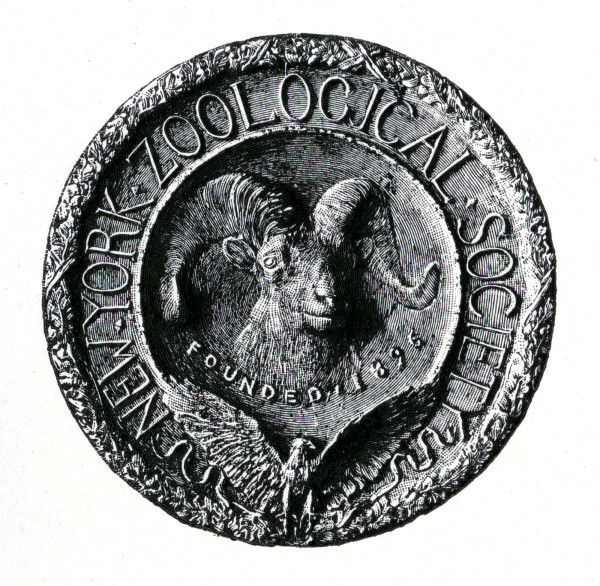 As president of the Boone and Crockett Club, a hunter-conservationist group he founded, Roosevelt had also taken a distinct interest in the need for a zoo in New York City–one that would be led by scientific and preservation-minded interests, unlike the already existing Central Park Menagerie. Roosevelt appointed a committee of Boone and Crockett members Madison Grant, C. Grant LaFarge, and Elihu Root to address the issue. The committee soon learned of the Green-backed bill and signed on to the existing list of incorporators, which included such influential figures as businessman Charles Dana, lawyer Charles A. Peabody Jr., and journalist Oswald Ottendorfer. 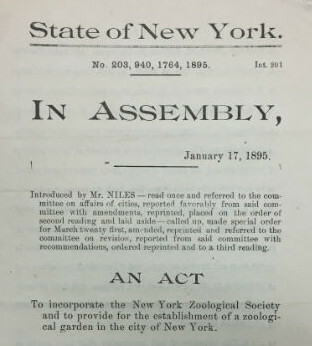 Although the bill underwent a prolonged battle (particularly over the relationship between the proposed zoological park and the Central Park Menagerie, a fight described in further detail in William Bridges’s Gathering of Animals), the act to incorporate the New York Zoological Society and to establish a zoological garden for New York passed on April 26, 1895. 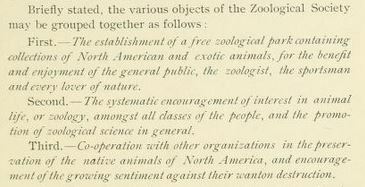 Like the other original incorporators, Green knew very little about zoos and zoology, and the Boone and Crockett members soon asserted their dominance in these fields and over the Society in general. While Green was elected the Society’s first president, he resigned soon after–possibly because the Society’s board did not share Green’s focus on dismantling the Central Park Menagerie. 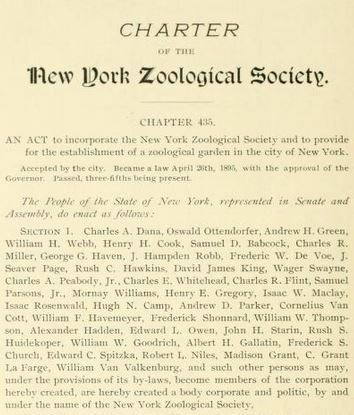 Instead, the New York Zoological Society turned its attention to “founding a zoological park adequate to meet the demands for the education and recreation of the people of this great city”–to no less than, as the Society’s first Annual Report continued, creating an institution that would “appeal to and directly benefit a greater proportion of the three million inhabitants of this city than will any other enterprise that has been undertaken for the higher education or healthful pleasure of our people since the establishment of Central Park itself.” That institution would become the Bronx Zoo. But the Society’s aims extended beyond creating a zoo. In addition, WCS’s founders also sought to stimulate the study and the protection of wildlife, as they described in the objectives listed above. And while some of the particulars have changed (the conservation focus expanding beyond North American animals, for instance), the essential goals of inspiring public interest in and protecting wildlife have guided the Society over the past 120 years. To celebrate 120 years of conservation, enjoy historical walking tours of the Bronx Zoo at 11 AM, 1 PM, and 3 PM on Saturday, April 25 and Sunday, April 26. Also, the first 120 visitors at each WCS park will get a free cupcake! Very nice post, thank you my Archives friends! Since the park is referred to as “Bronx Zoo,” it might be of note that the official name has been New York Zoological Park to this day and “Bronx Zoo” was never recorded as the official business name until several years ago. Great point, Kimio! Hornaday would be rolling over in his grave! Happy birthday WCS and many many more. Here’s to your success and to your commitment to keeping our planet and all its wonders in good condition for us all to benefit from for eons to come. Please keep up the good fight for justice for elephants and rhino.